The dangers of distracted driving are increasingly understood by the public. What many drivers may not know however is that all distractions are not created equally. There are three primary kinds of distractions: visual, cognitive and manual. Manual distractions require motorists to take their hands off the wheel, visual distractions take eyes off the road and cognitive take minds off of the act of driving. 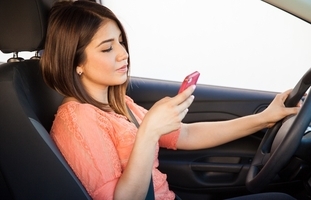 Texting while driving employs all three kinds of distractions. Certainly, a heightened risk of auto accidents occurs whenever motorists are distracted in any way. However, texting while driving is among the unique class of distractions that impairs every critical driver function. This simple reality has inspired state legislators to introduce legislation aimed at banning texting while driving on Florida roads. A new bill would impose $100 fines for first-time offenders of a ban on both texting and hands-on cellphone use while driving. The bill would permit only hands-free cellphone use behind the wheel. Fines would increase for offenders who are caught violating the ban on multiple occasions. Some are concerned that banning texting and hands-on cellphone conversations will infringe upon the privacy of motorists. However, there is a solid reason why 44 states in the union already ban texting while driving for at least some of their residents. Quite simply, texting while driving heightens the risk that an individual will be involved in an accident by 23 times, according to the National Highway Traffic Safety Administration. Texting bans save lives. More than 3,300 American lives were lost in 2011 alone due to preventable accidents caused by distracted drivers. Hopefully Florida legislators will favor public safety over a small exercise of privacy in this particular instance, given how many lives are at stake.